The Indiana lease agreements are written for the terms between a landlord and tenant for either commercial or residential property. The tenant, or lessee, will usually view the property and, if acceptable, negotiate orally with the landlord, or lessor. After a deal has been reached over the main points such as rental amount, time period, renewals, and any other details to be agreed upon the form should be signed by both parties. After the form has been authorized, security deposit been given (if any), and all the initial terms have been met access to the property, such as keys, should be given to the tenant. Rental Application – Used to screen and ensure that a potential tenant is the same person they claim to be when applying to use the space. Commercial Lease Agreement – For any type of industrial, office, or retail space. Lease with Option to Purchase (Lease to Own) Agreement – Standard contract with the added benefit of having the right to buy the property during the term. Month to Month Lease Agreement – A type of contract that allows either party, landlord or tenant, to rent residential property and have the option to cancel at any time with at least one (1) month’s notice. Room Rental (Roommate) Agreement – To be written with all the members of a housing unit that is split between individuals that rent bedrooms and share common space such as bathrooms, kitchen, living room, etc. Standard Lease Agreement – Most common type of contract with the time period being fixed. Usually a twelve (12) month arrangement but may be anytime as determined by the parties. Sublease Agreement – Allows a tenant to get someone else, known as a sub-tenant, to rent the space they are under agreement for until the end period or any other time as agreed upon. Usually the landlord will need to sign-off on any new sub-tenant(s). 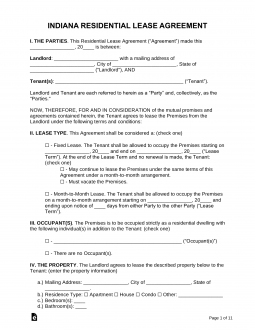 Termination Lease Letter (30-Day Notice) (§ 32-31-1-1) – Allows a landlord or tenant to terminate a month-to-month rental by use of sending this document with at least thirty (30) days’ notice to the other party. Lead-Based Paint – Under federal law if the landlord’s property was built before 1978 it is mandatory that the disclosure form be attached, initialed, and signed by the lessee. Managers and Agents (§ 32-31-3-18) – The landlord must disclose the name of the person allowed onto the premises in addition to an address for notices and repairs. According to § 32-31-5-6 a landlord may not enter the space for any non-emergency related use without giving reasonable notice either written or orally. Maximum – There is no State cap. The landlord may ask as much as desired from the tenant. Returning (§ 32-31-3-12) – All landlords are required to hand over the money back to the lessee within forty-five (45) days from the termination of the lease and delivering the property back to the lessor.